Stylish Contemporary Design: This rack looks great with a variety of cabinet styles and finishes. Simple to Install: This under cabinet stem rack comes fully assembled and ready to mount to help you conserve space in your kitchen. The rack hangs 1 ½" below the cabinet sizing 13 ½" long and 8 ¾" deep. 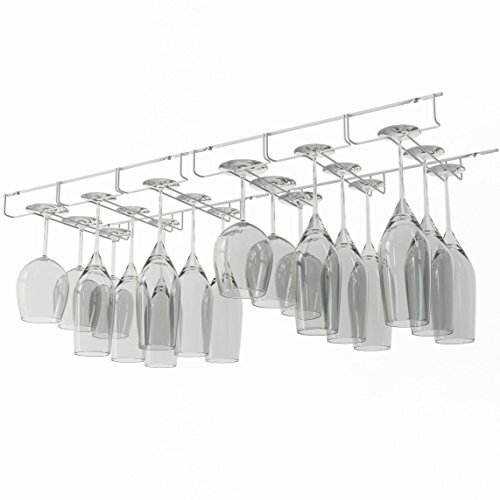 Holds Up to 18 Glasses: These racks look great and keeps your stemware ready to go for impromptu gatherings. Depending on the style of the glassware, you can store up to 18 glasses with a base up to 3 ½ inches. Functional and Elegant: Made of painted steel this stemware rack adds a touch of elegance to your kitchen or bar décor. With durable construction, each rack is easy to clean and will last a lifetime. Get More for Your Buck: With 6 rows you will have enough room to store all your glassware for entertaining, but should you need more space you can install multiple units side by side for additional storage and do it all for an affordable cost without hurting the bank account.